Clear aligners are one of the most popular new types of braces used to straighten teeth. Invisalign is the most recognised international brand that dentists use to provide clear aligners braces. But do you need to keep your Invisalign trays after you move to the next set? Do I Keep Invisalign Trays? How Many Invisalign Trays To Keep? What To Do With Old Invisalign Trays? Can I recycle Old Invisalign Trays? How Can I Clean My Invisalign Trays? Answer: Keep the current AND the most recent set of Invisalign trays. Any earlier trays do not need to be kept, and can be disposed of. Previous trays from earlier on in your Invisalign aligner treatment will no longer fit your teeth. Trying to force an older tray into the mouth will be uncomfortable. It can also compromise you Invisalign treatment and make it take longer. It is usually best to discard of older aligners to avoid ANY confusion about which set of trays are current, most recent – and older. This provides you with eh current treatment trays and one backup set in case something happens. Discard your old trays. That’s right 0- just throw them away. Any set older than the most recent set and the current set have no purpose to your treatment. They won’t fit your teeth any more as your teeth should have moved! Keep your Invisalign trays as a memento. People like to collect crazy things – so why not collect your trays? Some people do, just make sure to clean them well first using a dissolving denture tablet or white vinegar and water. Whether you can recycle the Invisalign tray is a very interesting question. Invisalign treatment do use a lot of plastic! Many us are keen to recycle plastic whenever possible to minimise our carbon footprint and protect the environment. The official answer from Invisalign is that “You cannot recycle a medical product” (link to Invisalign posting this on their social media)- as the trays have been in your mouth they are considered a medical product. You should check your local reclining guidelines – but perhaps the trays are better in the landfill bin. Either way, it would be a good idea to disinfect your old trays with a denture cleaning tablet, or white vinegar and warm water before you dispose of the trays. 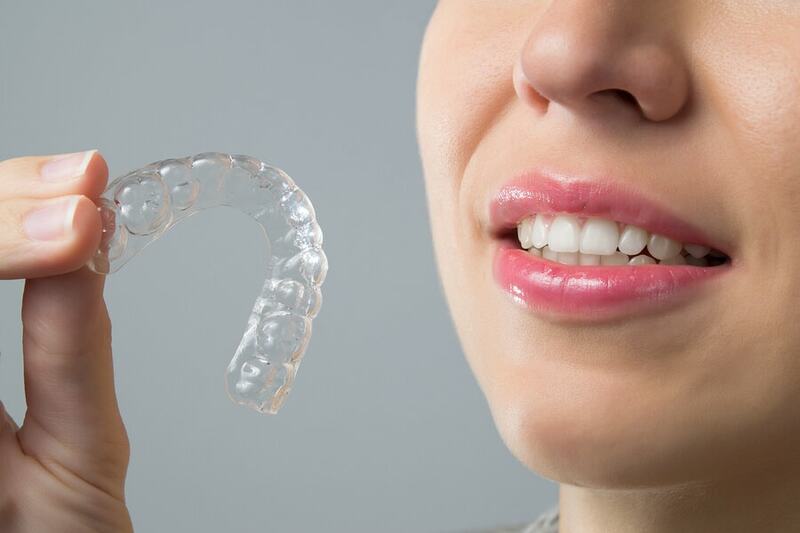 The best way to keep your Invisalign trays clean and fresh are to regularly rinse them. After waking up, before going to bed, and after each meal and drink that is not water. Even clear flavoured water needs to be rinsed with plain water to keep the tray clean and not stink. The second best way to keep your aligners and older set of aligners from smelling is not very glamorous. I strongly recommend using denture cleaner (a dissolving denture tablet) to keep the aligners fresh and clear. A backup option is to soak the aligners in diluted mouth rinse (such as Listerine or Colgate brands). However this can occasionally stain the aligners or give it some taste. If the aligner is particularly stained, a diluted mixture of white vinegar and water soaked for 20 minutes then brushed gently with a soft toothbrush can help remove dark stains from coffee, curry, berries, or other colourful foods. So… I don’t really need to keep Invisalign trays? Only the current trays, and the previous set of trays should be kept. For most people there is nothing gained by keeping additional older Invisalign trays. The trays have spent hundreds of hours in your mouth, so even with the best cleaning they are not hygienic. If you can’t think of a reason to keep them and your dentist or orthodontist hasn’t told you to – just bin them! What if I’ve lost my Invisalign tray after I was done using it and my dentist has asked me to keep them? Do I need to give them back to him or is it just a precaution? If I do need to return them, will a missing tray be an issue? If I ordered a new one, I wouldn’t need to use it.